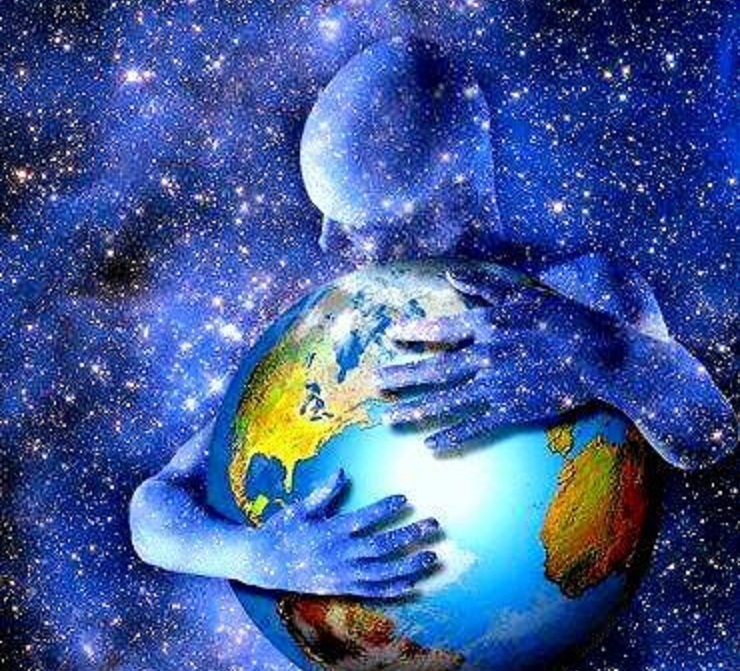 For 46 consecutive years, we have celebrated Earth Day, and yet the status of this planet is worsening. On the sixth Earth Day, in April 1975, we were in the process of the first overshoot of our global footprints. Since then, we have used up a larger and larger share of the Earth’s diminishing reserves, crowding out eco-systems to replace them with linear activities. We have all the opportunities in the world to change the course, and a lot of things are undoubtly done. What is happening now however is that improvements are local and implemented within either regions (by political demand) or within companies (due to genuine convictions and green marketing), but in the same time, things like fracking and tar sands are exploding on the market, the cattle industry and meat production beats all-time records, and the main concern for decision-makers within both the western sphere and the BRICS sphere is how to maximise economic growth. What forces are genuinely interested in saving this must plead, beg, work hard for little to no economic gain and almost apologise for struggling to save the lives of all of us, while those who are more responsible for the current state of our world would never have to worry about being homeless, about having to move around or whether they would have to buy food or medicines. 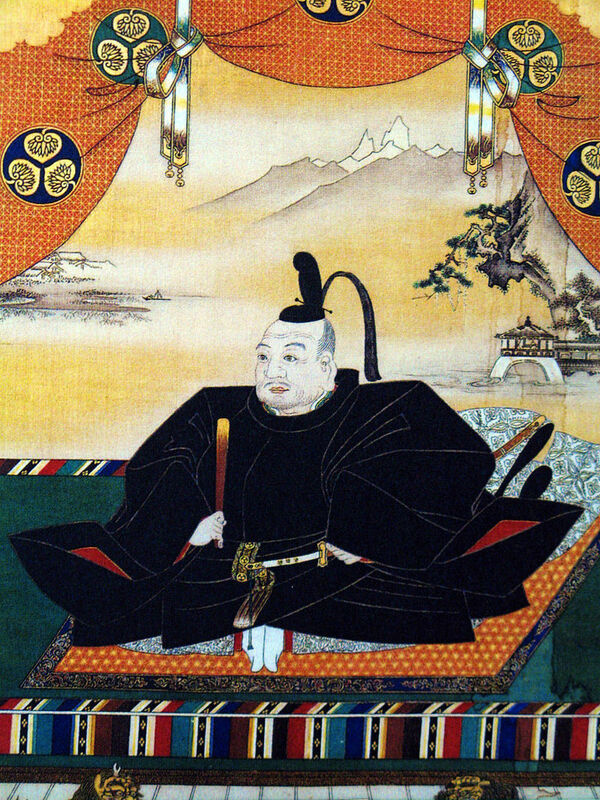 This post is devoted to those heroes of our time. Alexander Bascom and Ann-Sofie Svensson. 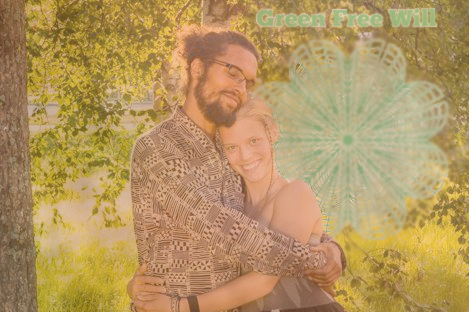 A young couple in Umea, Sweden, who are passionate about innovation and aquaponics, they founded Green Free Will back in 2012, and sought resources to realize their dream of constructing automated biodomes which would transform our entire relationship with food. Their tale is one of love, struggle, many setbacks and triumphes. Entering a collaboration with the Earth Organisation for Sustainability, Green Free Will was awarded an agricultural development grant from the European Union, which however took a long while before it arrived due to the bureaucratic structure of the application. 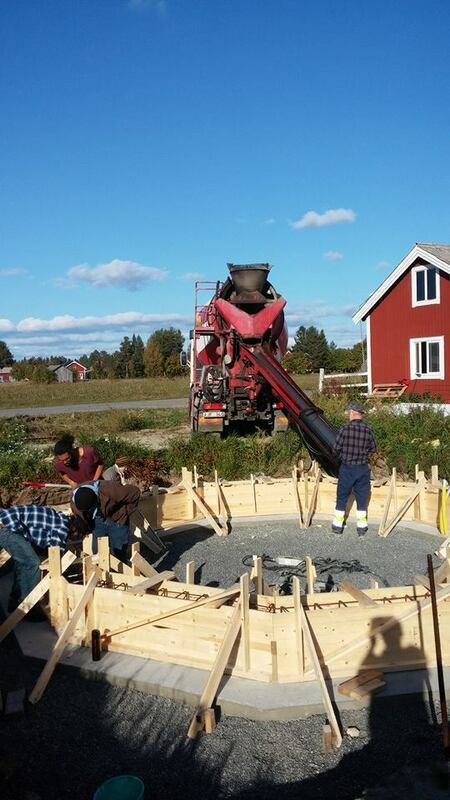 When it finally arrived, we were all overjoyed, and so the construction could commence during the late summer of 2014. Today, I feel privileged to announce that the last part of the grant was recently transferred to EOS, and is now transferred to Green Free Will, so they can do the last work on the dome before the next phase of the project begins. It fills me with happiness that Green Free Will’s project will receive a much needed morale booster. Alexander’s and Ann-Sofie’s story is awesome, though not unique. Everywhere throughout the world, there are idealists struggling both to make their household economics hold together, and to initiate revolutionary innovative projects that will change the way we look at the world. This vanguard of the garages is a bright hope for humanity during Earth’s darkest hour in 65 million years. One of the purposes of the EOS is to cooperate with and help people who burn for projects to realize them. As a small organisation, we sadly do not have unlimited resources. By helping us, you will help people like Alex and Ann-Sofie and organisations like Green Free Will to network and expand. Ultimately, what we all are struggling for is the very foundation for our existence. In this matter, you are either for life or for death. So thank you Alex and Ann-sofie, Richard, Jonathan, Stefan, Maria and the others! You are making the world a better place! 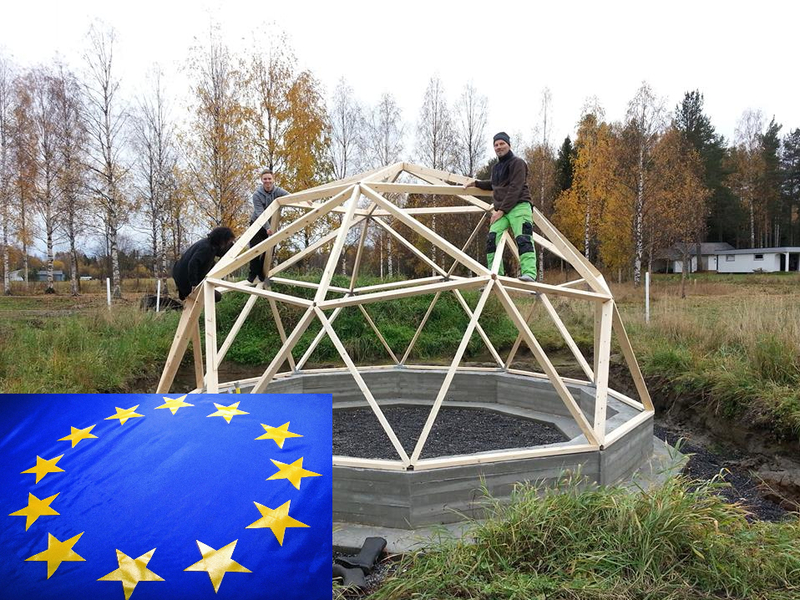 The collaborative project between Green Free Will and EOS has finished the first stage of the Umea Biodome Project, which is also a EU-funded LEADER project (thankies EU)! The foundation and the “skeleton” of the dome are ready. Now we only need panels there. 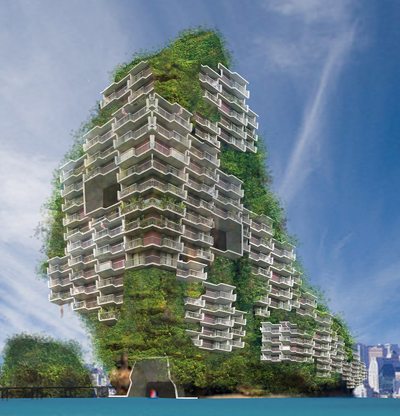 The second stage of the project will see the insulation system established, the aquaponics installed, and the third and most challenging part will be the computer systems that will regulate the climate and atmosphere of the interior of the dome, amongst other things. EOS and Green Free Will is aiming for a meeting to discuss – amongst other things – the future of this cooperation. The main challenge will be to acquire funding for stage 2 and stage 3. For more on this, check this. 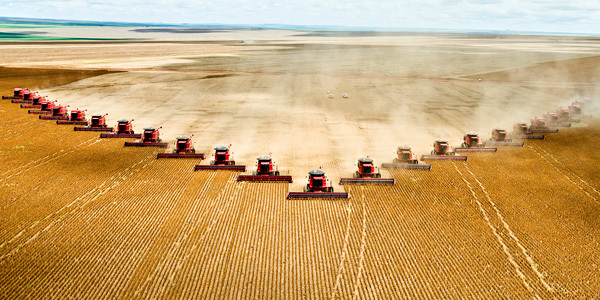 How should we produce our food in the future, and after what principles? As the biodome is realised, come and hear their story of the struggle to change the way we interact with our environment. 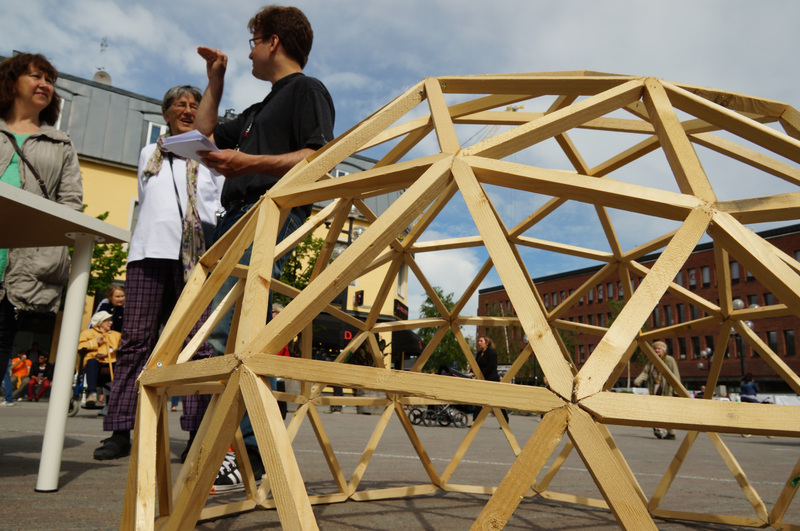 This event will happen in Café Planet (Kungsgatan 101), during the Survival Kit Festival, 3-5 PM Saturday the 11th of October 2014. 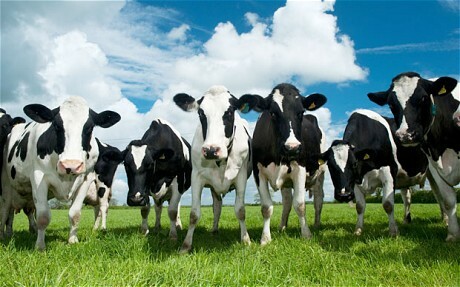 You are all warmly welcome! As you who have followed this project know, we have had some troubles getting the second half of our grant (and you should know we’ve tried since March). Now, it seems like we’ve would get 86.000 SEK, which would cover both for remnant costs of the construction process until now, and the panels. However, that does not mean that the crowdfunding initiative will cease. The next step after the panels are the programming systems and the computers, and those pieces do – as you probably know – cost money to obtain. Nevertheless, for the moment, the project is saved and can move on. Green Free Will at work! The Biodome Project progress can be followed on http://enggreenfreewill.wordpress.com. The construction team are doing an awesome work. However, one of the problems we have encountered with the LEADER support grant we’ve received has been that we have encountered demands on additions and elaborations to the reports we send in to explain how we’ve used the part of the grant we received first. The result is that our payments are delayed by constant demands on more and more specifications. If we do not receive our next payment, we can have trouble finishing the project as it stands, and we are risking to be liable of the grant. This is not how it should go, because we have all struggled very hard with this project, a project that is non-commercial and aims to create a better world. 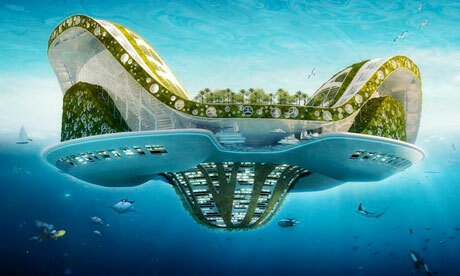 The goal is to build an automated experimental biodome with an aquaponics system, connected to a computer system that can alter conditions inside the dome after the changing needs of the ecosystems inside said dome. We would need 60.000 Swedish Crowns to complete this stage of the biodome and pay our costs. That is 9000 USD and around 6500 Euro. We have already received 1000 SEK during the early stages of this fundraising, and that money would go to compensate some of the practivists of Green Free Will for their gas costs driving to the site for voluntary work. Needless to say, that is a small fraction of our costs. If we receive our next part-payment from the County Board of Vesterbotten, we can refund your donations as “private expenses”, so you can get your money back. Note that we are not sure when the next part-payment will arrive, or if it will arrive, given the experiences taught us by the process until now. That is why we are asking for a donation and not for a loan. You can donate a sum of money through Paypal or to our official bank account. The future needs your help!